Frank Shaw Associates produced the submission winning design, on behalf of Kier, for Peterborough City Council and the Academy sponsor, The Ormiston Trust. Ormiston Bushfield is a 900 pupil Academy with Sports and Maths as its specialisms, and also includes a Post 16 Centre. 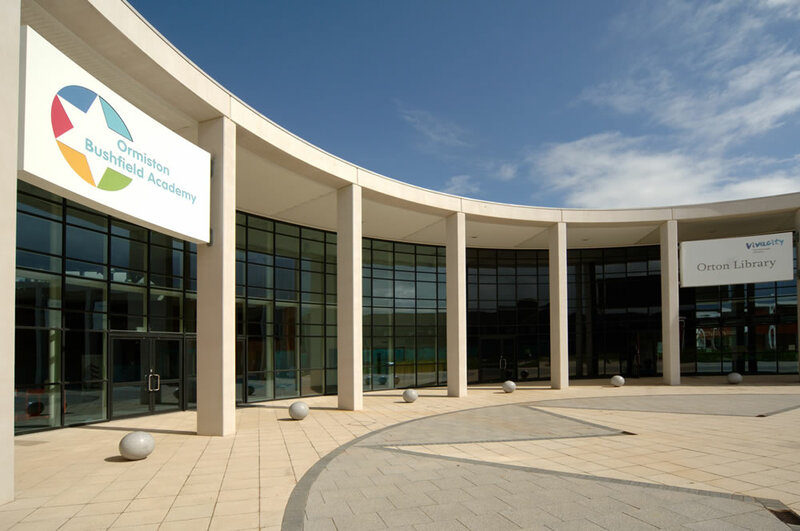 The Academy has also achieved BREEAM Excellent. In addition to the Academy, the design incorporates multi-agency functions including a Public Library, Early Years Centre, and Young Persons Centre. The design also incorporates a dramatic restructuring of the local neighbourhood centre, creating a new learning quarter. Notes. Planning consent was achieved in 6 weeks. 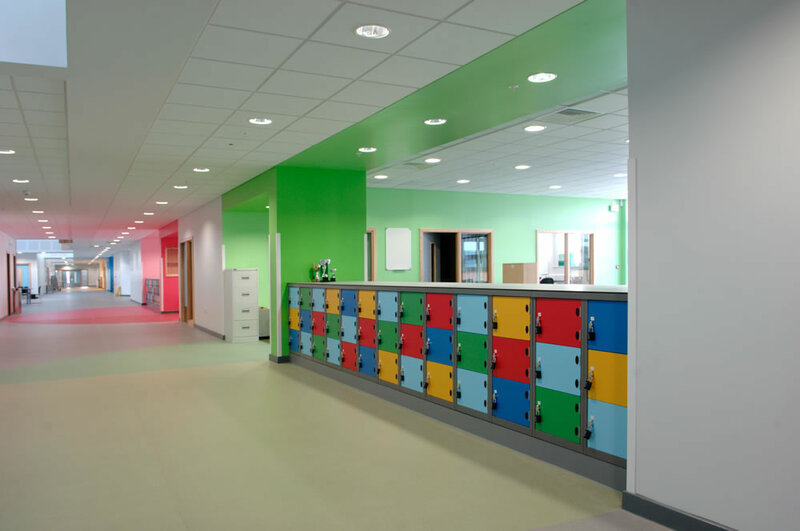 We engaged with staff and pupils during the development of the design. This project provides a ‘state of the art’ home for the Academy’s 900 pupils including a new Post 16 Centre. The project provides a new Public Library, independent Early Years and Young Persons Centres together with enhancements to the neighbouring Bushfield Sports Centre. 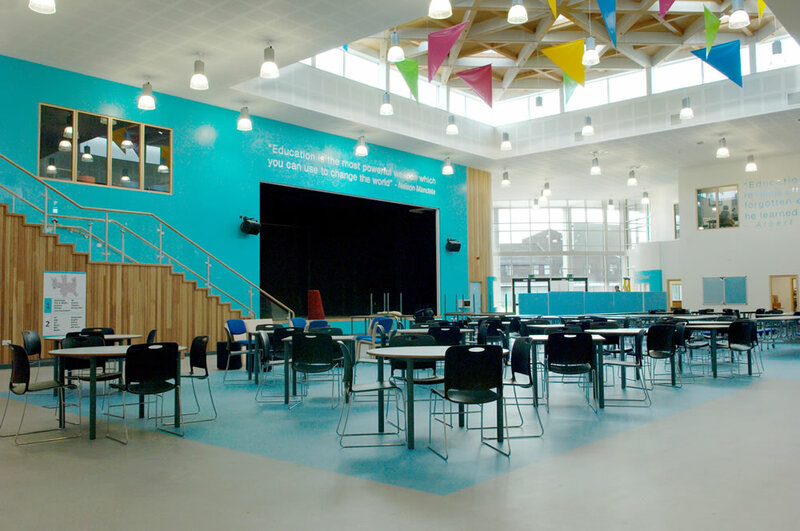 During the design development a close working team was formed between Peterborough City Council, Ormiston Academies Trust, architect and contractor when the project requirements were crystallised into the final scheme. 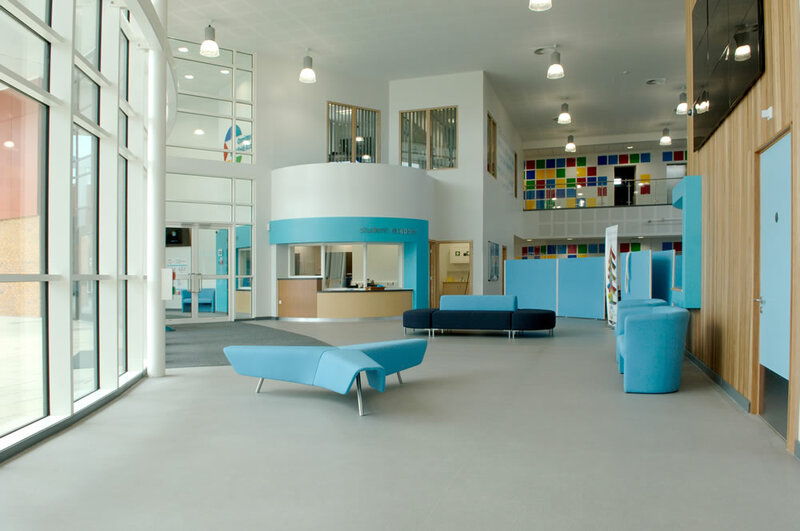 The project team benefited from the considerable help and support of the Local Authority Planning, Building Control, Highways, Fire and Police liaison officers so that each phase of the scheme was delivered on programme and within budget. Principal features of the design include an impressive double height concourse/dining hall overlooked by the performance stage and first floor galleries, specialist curriculum areas focused around informal teaching spaces and generous student house bases located of the central mall. Externally the public face of the building features a striking colonnaded facade. New sports pitches and games courts have been provided, including a shared use 3G all weather pitch. The Academy forms the northern boundary of an extensive new public plaza created as a result of the demolition of the previous 1960s school building. This impressive public realm links the Academy with its local community and contributes to the ongoing regeneration of the Orton Centre. The new building creates an educational, cultural and sporting focus for a new Ortongate learning. View our design fly-round below.